Two full productions (December 2013/14) in Grass Valley/Nevada City, California in (15 performances each year including ones for Middle School audiences. )The cast included 9 children (age10 to 16, four of them had leading roles) and 4 adults in support roles. Play highly suitable for general audiences. 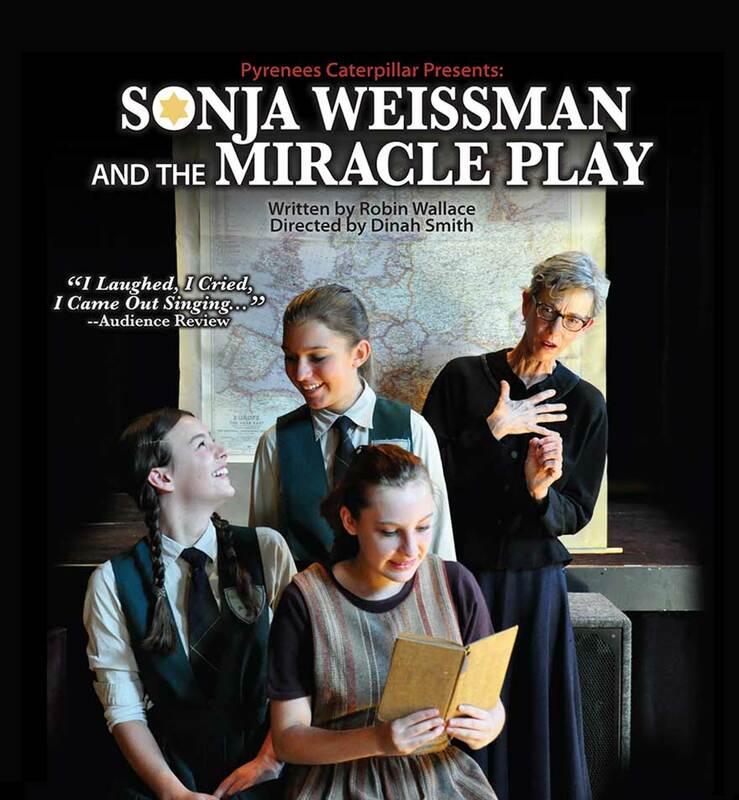 The playwright, Robin Wallace, and Director, Dinah Smith, presented a 90 minute Powerpoint presentation about the production of “Sonja Weissman and the Miracle Play” at the Forum on Educational theatre at New York University in May, 2016. The time is November 1946, a year after the end of WWII. The place, a small Episcopal somewhat dilapidated boarding school for girls in Quebec, Canada. The six girls (13-14yrs) who share Dormitory 6, practice and compete for parts in Miss Miller’s Miracle Play (a Nativity play from the Middle Ages.) One of the girls is Sonja Weissman, newly arrived from Poland. She speaks only a few English words, but in spite of this, she tries out and earns the part of the third shepherd along with M.J. and Joan her new supportive friends. There is something mysterious about “foreign looking” Sonja, and the interesting fact that she has “rich guardians. The girls try to figure her out by their mostly mis-conceived and prejudicial ideas. This was in an era where there were no therapy sessions or honest explanations by the teachers about Sonja’s background. Curiosity and even resentment builds among the girls involved in the play. Some believe that a Jewish girl should not participate in a Christian play and they are extremely vocal about it. But Sonja reveals her strong character, her formidable talent as an actress, and as her English improves, her personal tragic story of survival. The “Miracle Play” and each girl’s truth about their own individual sadness ultimately brings them together in a more compassionate understanding of each other. At the end, M.J., who has been Sonja’s main supporter, magnanimously invites all the girls in the play to visit her Nana who lives in her huge house near the Parliament Buildings in Ottawa. Although Sonja Weissman is the title character, she is really the pivotal one. M.J. (Mary Jane Young) is the main character. What led to the writing of this play? This play is based on a vivid memory I had as an 8 year old in 1946. I had recently settled in at a small boarding school in rural Quebec where suddenly my new roommate arrived: a mysterious new girl from Poland. I was intrigued that she had guardians, instead of parents but of course I never knew her full background story. If I had been older, say about 14 and more knowledgeable about the world, I might have. Many years later, I thought about her when I started to write fiction. Needless to say, much research fed the writing of this play. Today, the knowledge of the Nazi holocaust 1938-1945 is so embedded in our consciousness, making it difficult to imagine what it was like to live without such knowledge. During World War II, news of what was going on in Europe regarding Hitler’s “Final Solution” was not generally known, since the media did not report it on the front pages. I started with a short story, which then became a novel; then a screenplay that was eventually optioned by Jennifer Jonas in Toronto. It was never made and I remain thankful as the story was greatly changed when she pitched it to potential funders. I had pretty much given up all rights. 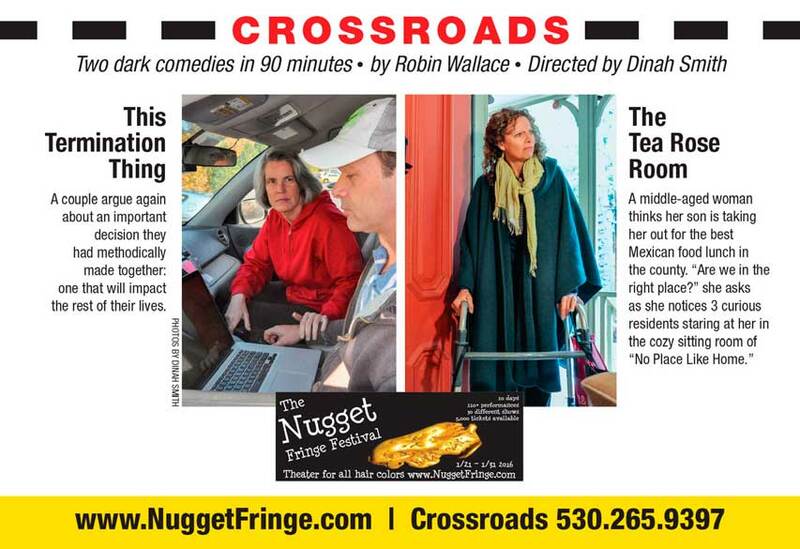 Eventually I wrote it as a 2 Act play with music for 2 full productions in 2013 and 2014. Since they were received with great enthusiasm by the casts and audiences, I have felt that the story finally found its home! The play is also set in the past, back in 1946/47, a year that marked the beginning of the Cold War. While visiting i M.J. in her Nana’s house in Ottawa, Sonja, along with Joan and Patsy, become aware of the greater world and in particular, the Soviet espionage to steal the atomic Secrets. M.J’s mother, Charlotte, has a new “friend” who is a journalist for the Ottawa Journal. Karl Fischer is covering the story of Igor Gouzenko, the Russian cipher clerk who has defected from the Soviet Embassy with documents revealing the spy ring in Canada and the United States. If that isn’t enough, the sudden antipathy to the Soviets and Communists, has negatively affected the immigration policies regarding Canada’s acceptance of Jewish refugees from Europe. M.J’s Nana, the hostess, believes in the immigration policy of “None is Too Many” articulated by an Immigration official. This causes a confrontation with Nana, the imperious Mrs. Stewart over the fact that M.J. did not inform her that Sonja was Jewish. The young girls’ experience during this memorable New Year’s weekend affects them personally and politically, in ways that will impact the women they become. Their reunion 70 years later in the same house after they find each other on Facebook, brings startling new insights about their lives and what has happened to the world in the intervening years. Basically, Themes of how local and world events affect and form our fears and attitudes towards immigration, prejudice and enduring friendship are explored in this serious but often comical and heartwarming play. How I came to write this play. A suggestion from two of the young actors from the original play began the process. So they could find out what happened to them next. I began researching what was happening in the world 70 years ago and soon realized that world events today uncannily reflect the uncovering 70 years ago of a Soviet spy ring centered in Ottawa, the capital of Canada. The goal of the espionage was to acquire atomic secrets developed in the Manhattan Project. Even though I was very young at the time, about 8 years old, I remember very vividly the photos of Igor Gouzenko, hooded by a pillowcase, in the newspapers. I did a google search to see if anyone had written a play about him and couldn’t find anything. There was a movie made in 1948, “The Iron Curtain” the story of the start of the Cold War with Dana Andrews and Jean Tierney. In 1929, the spirit of Josiah Royce (1855-1916) visits Royce Hall on the UCLA campus 3 days before its inauguration. He is prompted by a chance encounter with a young student to look back on his life in Grass Valley during the years of 1862-1866. The young Josiah lived with his mother, Sarah Royce, and 3 older sisters on a farm just outside the notoriously wild mining community. The father was mainly away during this period running a mercantile in Virginia City, Nevada. The play intertwines the Grass Valley events and eventual thought of the mature Josiah Royce who rose to eminence as an internationally known philosopher and chair of the Philosophy department at Harvard for 37 years. In the last scene, the young UCLA student visits Katherine Royce (Royce’s widow) in Cambridge In an effort to get some important questions answered about the spirit he encountered outside Royce Hall. The other characters are played by local young actors: Orion Molaro (young Josiah), Jozi Gullickson (Ruth Royce), Amalia Drummet (Hattie Royce), Patrick Moore ( Josiah Royce Sr, the father), and Graham Collings (the young UCLA student). In the beautiful Gold Rush area of N. California sits a large old Victorian style farm house. It is now a board and care home accommodating 6-8 elderly ambulatory and non-ambulatory residents. The play takes place in the cozy sitting/dining area. At opening three residents, Mrs. Church, Hank Keating and Wallace Belcher are involved in their usual morning activities of another “same old day.” Rosario sets the lunch table with a certain Mexican flare. A phone call from the manager, Melody, alerts him to the fact that she will not be there for lunch and he is to welcome the new lady and make her feel at home. Rosario is more than willing and capable and he lets the residents know that a first good impression is required. Sandra tries to save face in the situation by maintaining polite control and socializing with the residents. She learns from each of them their circumstances and philosophies. She firmly refuses to ever see the tea Rose room and becomes more and more hostile towards Rosario. She is determined to go home and confront her son and the manager with this unconscionable “behind her back” intervention. She hangs on to her volition that she will be where she alone decides to be. As she waits for her son to arrive to take her home, perhaps she’s not so sure after all. “THIS TERMINATION THING,” is only 10 minutes. It’s the actual length of an argument David and Jill have while parked in their car before making a momentous decision that will impact the rest of their lives. The characters are played by local actors, Lindsay Dunckel and Brian Arnold. Bodie, a long haul truck driver, arrives home early to surprise his wife/sweetheart. But Jill has made other plans to visit her mother and they argue. Just before she leaves for the airport, their neighbor, Rachel arrives, ostensibly to ask for the return of her oval platter which Jill believes she has already returned. Jill leaves, asking Bodie to look for the platter. Rachel and Bodie converse, with a betrayal and a troubling secret being revealed, by each. Rachel makes a play for Bodie. Jill returns surprising them and a confrontation ensues. Just who is betraying whom?